Caitlin Armstrong submitted this photo and caption. 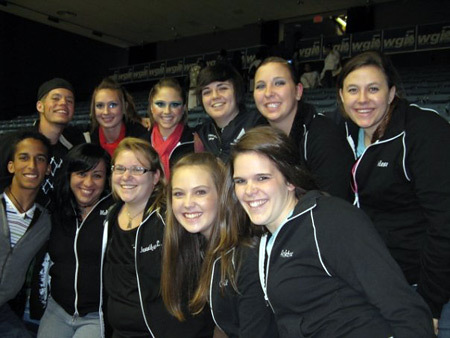 This picture was taken at the 2009 Winter Guard International World Championships in Dayton, Ohio. Many of the 2008 Spirit color guard members were in attendance for the Independent World Prelims, and it was a joy to see so many "baby blue" family members all at one time! This was only a small number of the whole group. Clockwise from the top left: Manuel (Fahrenheit World), Ryan (Code Black), Ali (Code Black), Amanda, Jen (The Knights), Jolene, Ashton, Caitlin, Jennifer, Melody (all of Northgate Independent), Joey (University High School).